One of the prominent challenges most African National Research and Education Networks (NRENs) are struggling to deal with is the lack of ownership of connectivity infrastructure mainly due to funding hiccups. Most of these NRENs are however operating alongside public and private telecommunication companies and organisations that own infrastructure such as fiber optic backbones that NRENs can use to transit their capacity. But for the past years, it has been difficult for NRENs to convince these entities to allow them use and access their infrastructure as most commercial and public Internet Service Providers (ISPs) see the presence of NRENs as competition within the industry. 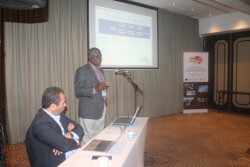 The Zambian NREN, (ZAMREN), is however providing a new perspective to this school of thought by establishing exemplary partnership models with commercial and public ISPs and other players that own connectivity infrastructure such as power and water utility companies. According to ZAMREN CEO, Bonny Khunga, the NREN has entered into highly benefiting synergies with the Zambia Information and Communications Technology Authority (ZICTA), the Zambia Electricity Supply Corporation (ZESCO), CEC Liquid Telecom Zambia and Nkana Water and Sewerage Company. Khunga says ZAMREN has signed a Memorandum of Understanding (MoU) with ZESCO to allow the NREN transit traffic on the power generating company’s backbone and another MoU with ZICTA for the support of Last-mile connectivity and special licence considerations. He also revealed that CEC-Liquid is giving ZAMREN discounted tariffs on its metro circuits and that the NREN can mount its equipment on water towers belonging to Nkana Water and Sewerage Company following fruitful discussions with the company. The CEO however admits that it is not easy for an NREN to convince infrastructure owners to allow NRENs use and access their property. He however says just like ZAMREN, other NRENs can access infrastructure of other companies or organisations operating in their cathment areas if they put in place good strategies which may include demonstrating to infrastructure owners that the NREN is not-for- profit driven but exists to serve the education sector. He also says engaging Vice Chancellors and executive directors of research institutions in discussions with infrastructure owners helps a lot. In addition, Khunga says running NRENs transparently by documenting every undertaking of the NREN in annual reports as well as acknowledging the contributions of infrastructure owners can also help a lot in coaxing owners to share their infrastructure with NRENs.